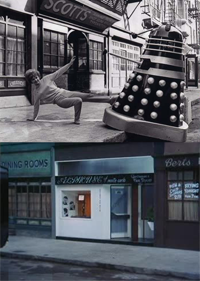 When watching Daleks – Invasion Earth 2150AD it’s possible to observe some curious features about the England of the future. When Wyler and Susan crash through a blockade of Daleks, their van drives down a street which has a curiously unfamiliar quality. As the pair make their escape, there’s a lack of coherence to their environment as they appear to zoom past a Mediterranean farmhouse, then hide near a mansion, before stumbling across a cottage on stilts. 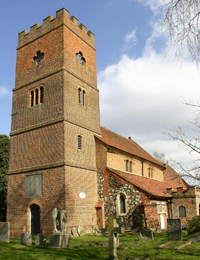 In 1135, a stone church was built in the hamlet of Littleton and named in honour of St. Mary Magdalene. It stood as the local place of worship for many hundreds of years, being rebuilt and modified several times. In the 15th century, a timber-framed Manor House was built on Squire’s Bridge Road and served for two hundred years. In 1689, Thomas Wood decided to build a newer and more impressive manor house in Littleton and the nearby church remained an important part of his estate. In 1705, new buildings were erected to the north of the chancel to bury members of the Wood family. The later stage of the tower was built in the decades that followed. By the Victorian period, the grounds to the east of Littleton House were landscaped with trees and gardens. To the south, on the bank of the river nearest the manor, a boat house had been constructed near a footbridge. Thomas Wood’s descendant, Captain Thomas Wood, held the manor of Littleton into the 20th century and it was around this time that the grounds to the west were landscaped and the area around the footbridge was developed. The old boat house was demolished and two new ones were built. A cottage was erected on the water’s edge, standing on stilts. In 1931, a Scottish businessman called Norman Loudon purchased Littleton Park for use in the burgeoning film industry. His Sound Film Producing and Recording Studios opened there in 1932. 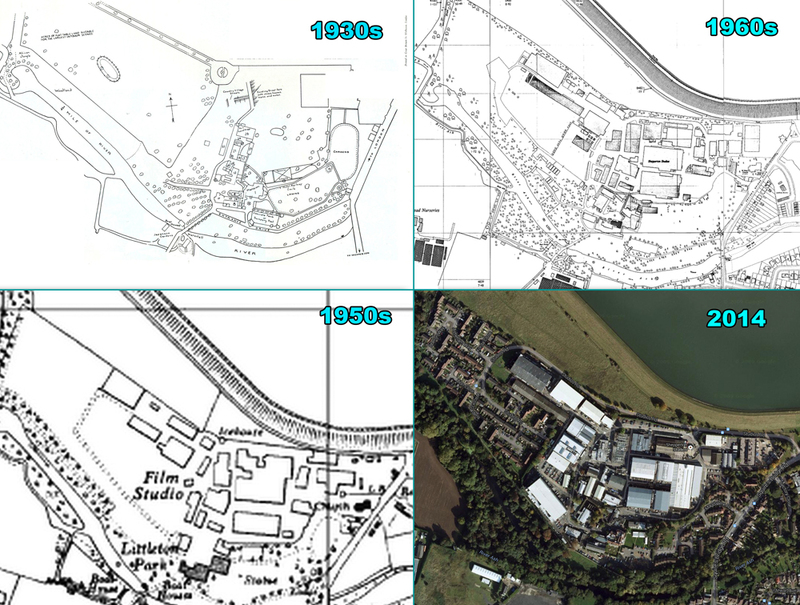 Rapid expansion followed and movies made good use of the landscape at Shepperton. 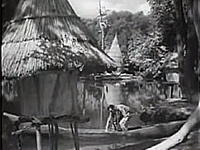 The 1934 film Sanders of the River used the local River Ash to portray an African river, complete with native village which was specially built along the banks. Thomas Wood’s Manor House was a fine backdrop to many shoots, and St. Mary Magdalene Church even made an occasional appearance. The war interrupted the running of the entertainment business and the nearby aircraft factory made Shepperton a target for German bombers. 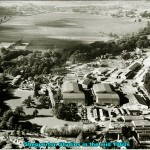 In 1941 the government requisitioned the studios for storage and then later to produce decoy aircraft. The site reopened in 1945 but under new ownership and it was sold again 1955 before it entered its most prolific period. During the 1960s, one of the companies based there was Amicus Productions. Founded by American producer and screenwriter Milton Subotsky and Max Rosenberg, it was under this name that many famous horror films were made. Shepperton Studio in the mid 1960s. Always looking for lucrative opportunities, Subotsky sought to capitalise on the enormous success of the TV show Doctor Who and, in particular, the most famous aliens that it had featured. 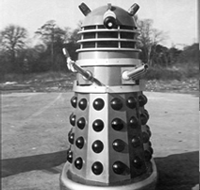 Along with film producer Joe Vegoda, Subotsky acquired the rights to make a Dalek movie, and the production was handled by Vegoda’s company, AARU. 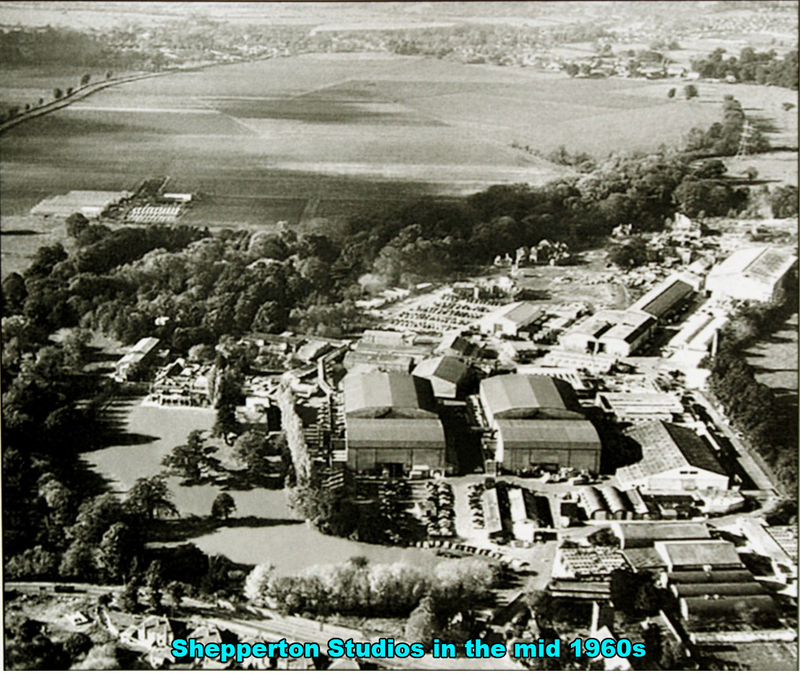 Shepperton Studios had been steadily growing in size since it was established and, in 1948, a new stage had been erected in the northwest corner of the site which became the largest in Europe. Stage H had moved from Isleworth Studios and had the ability to be flooded which made it perfect for large scale model work and set pieces. It was on this stage that Dr.Who and the Daleks was filmed, allowing for the immense vistas of the petrified jungle to be effectively created. Although Dr.Who and the Daleks needed no location filming, a number of promotional photographs were taken outside. All these shots unsurprisingly show the area near to Stage H where it was being filmed. The main four stars were in jovial mood and were seen directly outside the stage doors and adjoining stages. 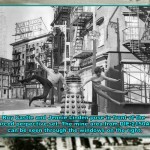 Various photographs exist from this period which appear to show the cast and several Daleks having fun in a New York street, with the Empire State Building clearly looming in the background. 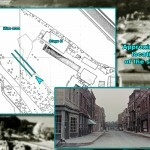 This unlikely situation, along with the lack of cars, is explained by the fact that these photos are also taken on the Shepperton site – the street being a standing set with fake frontages. The exact nature of this back lot and the significance of the shop seen behind Jennie Linden in some photographs will soon become clear. Once the first Dalek film was deemed a success, another was quickly planned. It was to be based on the TV adventure The Dalek Invasion of Earth and, despite an increase in budget, there were many practical difficulties. The fact that the cast included a large number of gigantic, metallic casings made location journeys difficult but a further challenge was faced in the fact that any exteriors were supposed to be war-torn and desolate. Despite the gigantic Stage H allowing for an expansive area of destroyed London to be created indoors, there were still plenty of scenes in the script which couldn’t be achieved in a studio, namely those involving vehicles. As well as the huge stages, the Shepperton site itself contained a number of generic-looking warehouses, brick buildings, garages and other bits of land. A simple money-saving option for exterior shooting was to use the streets that ran in between the studios as some city locations. In addition, the script included numerous scenes in which the main characters made their escape through the countryside. Shepperton’s extensive grounds included suitable areas of woodland and dirt roads that would be perfect for the journey through the home counties. 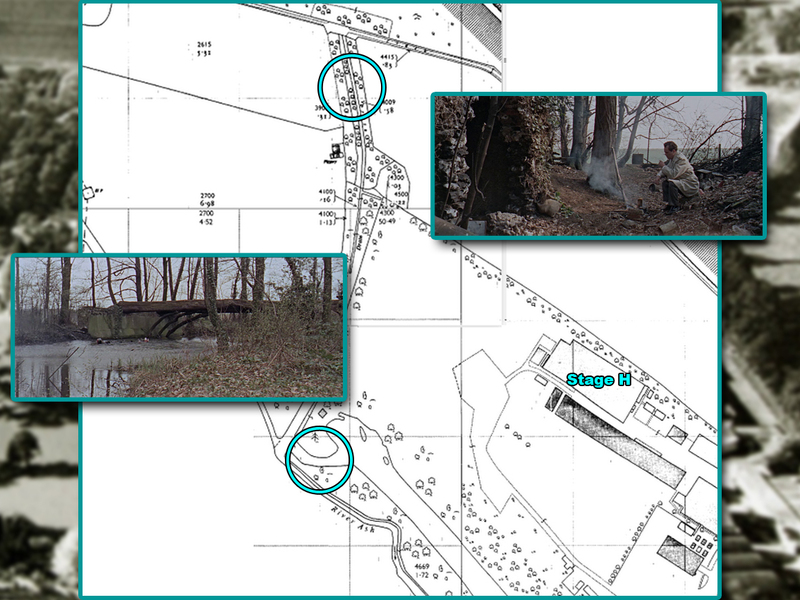 Following a recce by the director, half a dozen sites along the River Ash were ear-marked for shooting and three locations were chosen amongst the studio buildings themselves which could double for London. Click here to view all selected locations on a map. Filming got underway on 31st January 1966 and the first cost-saving sequence in “London” was set up only 500 yards east of Stage H, at a Shepperton’s Transport and First Aid garages. The scene involved Wyler and Susan stealing a van from a petrol station for their trip to the mine. The distinctive arched garages were redressed appropriately with fake pumps and signs, and rubble was scattered to sell the idea of a war-torn city. A false wall was erected to hide the true location – although a glimpse of the distinctive slope of Shepperton’s tree-lined reservoir can still be seen beyond. As Dortmun opens the door a brief view of the studios’ carpenters workshop can be seen across the way. The fact that the van is stolen from near a petrol station may have something to do with the fact that this film was one of the earliest to attract sponsorship from companies in return for product placement. There are seven Castrol signs on show as the van drives off! Daleks loaded for a trip to Cannes. 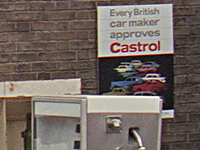 Interestingly, the Daleks had visited these garages themselves once before. Promotion for the first movie included a trip to the Cannes Film Festival and there was enough interest for a national newspaper to take pictures of the props being loaded onto a van at the studios. The loading took place on the main entrance road situated directly behind these garages. The area has now been redeveloped and new set of workshops partially cover the area. The main entrance has also now been redeveloped and lost to housing although the ‘Dalek loading site’ still exists but is now a car park. The large back-lot of Shepperton had featured in many famous films over the years. Sets would be erected and dismantled on the site as required leaving it extensively altered after each film. The fields to the north west of the site were particularly versatile (Click here for full map of the site and note the area marked “fields”). The mine area on the Shepperton back lot. The 1960s had seen the ITC production Danger Man frequently use the studios and the back-lot was exploited too. 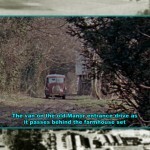 The fields can be seen in the episodes A Very Dangerous Game (1965), To Our Best Friend (1965) and Dangerous Secret (1966). 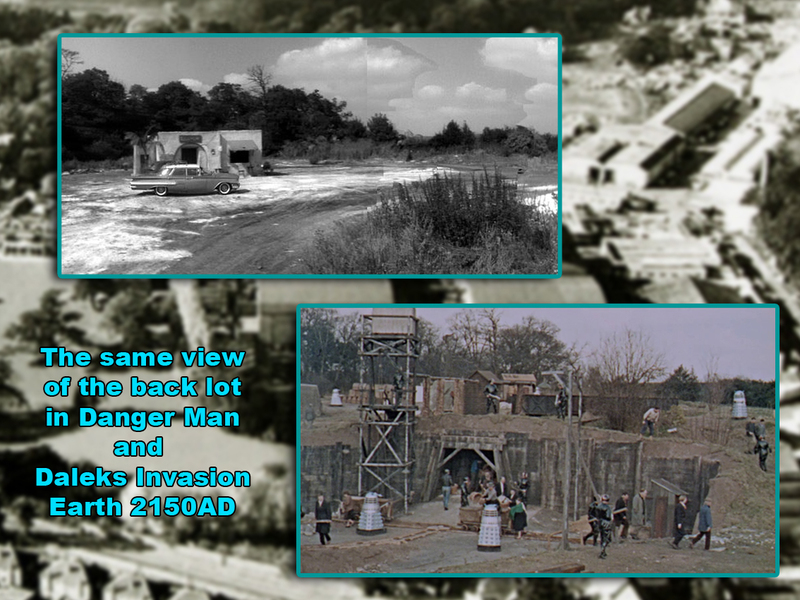 The same view of the back lot in Danger Man and DIE2150AD. For the arrival of the Daleks, the fields were a perfect site for the aliens’ mining operation. Mechanical diggers were brought in to shift a huge quantity of earth and the resulting hole was shored up to provide an entrance. The hill was dressed with sheds and random machinery to simulate a working facility. The embankment around the Queen Mary reservoir (to the north of the site) is visible in the film although in wide shots, a matte painting was used to hide it, and instead the Dalek saucer was shown parked on a mountain. In 1968, Oliver! was filmed at Shepperton and most the mine was swept away. The huge sets that were erected then stood for several years and featured in several other productions. In the early 1970s financial issues at the studios forced a large area of the back lot to sold off and housing was built on it. It is rumoured that locals regularly dig bits of film set up in their gardens! The biggest set-piece of the film came when Wyler drove his stolen van through a phalanx of Daleks. This was deemed too difficult to achieve on location (even though the TV series had managed it) and nearly impossible in studio. As luck would have it, Shepperton had a standing street set already built next to the mine workings. In early 1964, French directors Robert Dhéry and Pierre Tchernia filmed their comedy The Counterfeit Constable at the studios. The film required extensive use of London Streets for the main character to become lost in. A great deal of work was achieved on location, however, for a number of more involved shots, including a stunt involving a car crash, a large exterior street set was constructed. 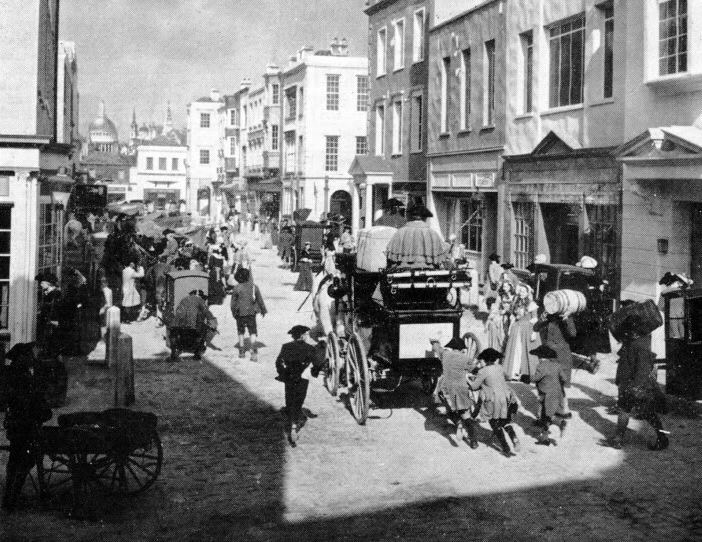 It was given a Victorian and Georgian style and featured lots of shops, several of which actors were able to enter. 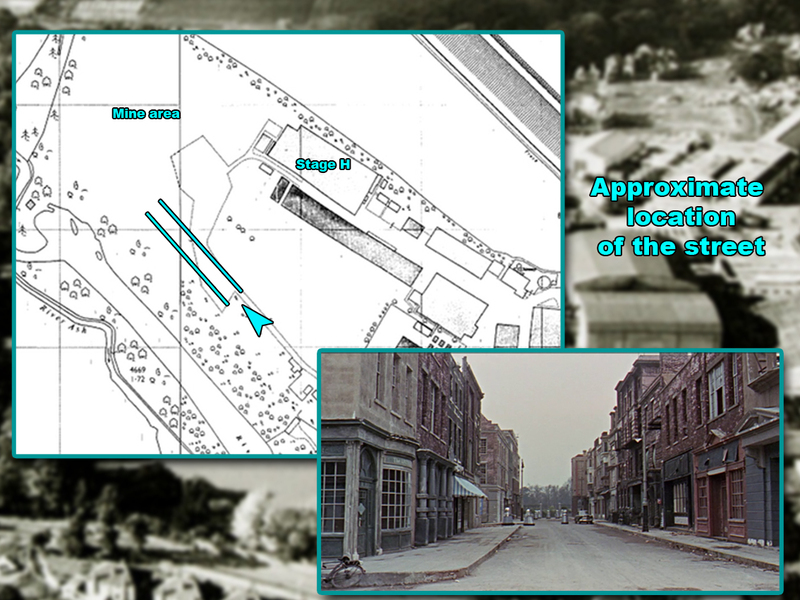 The set featured extra side streets and buildings at each end that covered the studio and backlot areas. The film featured Diana Dors and a number of comedians from both the UK and France including Bernard Cribbins who made his first appearance on the set. Sets of this nature were generally left standing if there was no immediate cause to remove them and they often added value to the prospect of bringing a production to Shepperton. And so, when during the summer of 1964, Director Terence Young had filmed The Amorous Adventures of Moll Flanders, an adaptation of Defoe’s lusty classic which required shooting in an 18th century London street, the set was almost ready made. 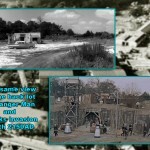 Throughout August 1964, the back-lot became a building site as the large, exterior set was adjusted to fit the period of the film. To add to the illusion of scale, a gigantic, painted backdrop was erected at the far end which featured St Paul’s cathedral. The street in ‘Moll Flanders’. The ground was covered with rectangular setts (often incorrectly referred to as “cobbles”, which were small and rounded) and the upper stories of the buildings were plastered and whitewashed. The buildings themselves appeared two or three stories high, but were entirely fake with just scaffolding holding up the fronts. Filming took place in September 1964 and the streets came alive with coaches, carts and many extras bustling around. The finished result is extremely effective, looking both extensive and authentic. During the 1930s, promotional material for “Sound City” (as it was then known) stated that “street sets and country villages are already build on the lot” to entice film-makers to consider Shepperton. 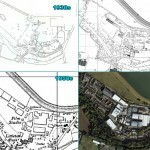 In the decades that followed, those particular streets and villages were removed but this new semi-permanent addition was made to the studios’ assets in 1964. The street in ‘Promise Her Anything’. Towards the end of 1964, pre-production was under way at Shepperton for another Paramount picture, entitled Promise Her Anything. This comedy film starring Warren Beatty was set in New York’s Greenwich Village and elements of the plot centred around the community’s shops. The exterior set used in The Counterfeit Constable and Moll Flanders provided an ideal starting point and so from the start of January 1965 Art Director Wilfred Shingleton oversaw the transformation of this street from Victorian London to 20th century New York. One side street entrance had new frontages constructed that were distinctly American in style. Four and five story buildings with dark brickwork known as “Brownstone” were created. This particular type of sandstone is common in the states and Greenwich Village in particular. Metal fire escapes were also added to many of the frontages and American-style lampposts and fire hydrants were dotted around. A replacement forced-perspective set was built which included the Empire State Building and Montrose Eastways Hotel, and this completed the transformation from UK to US. The finished set gave the impression that the street continued on into the far distance. With the extras milling around and American cars added, the street looked very impressive indeed. Roy Castle and Jennie Linden in front of the ‘forced perspective’ section of set built for ‘Promise her’ Anything’. The mine area can bee seen through the windows on the right. Dr. Who and the Daleks was also starting to film around the time that Promise Her Anything began and the opportunity was seized for a number of promotional photographs to be taken on the street set. It was hoped that the link between the Daleks and Warren Beatty might gain some column inches in the papers. 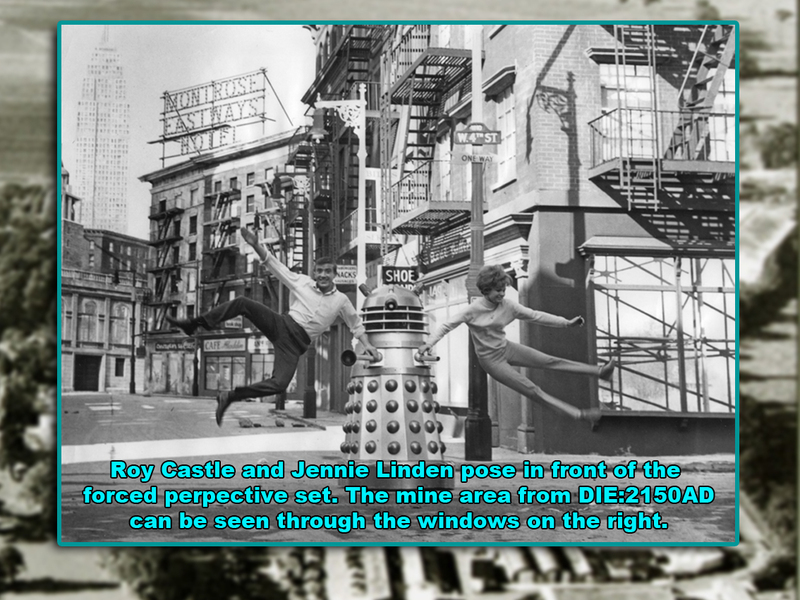 Roy Castle and Jennie Linden were pictured larking around with three Dalek props – AARU 1, AARU 2 and AARU 4. In several images the future mine-area can be seen in gaps between the frontages and through the windows of the false shops. 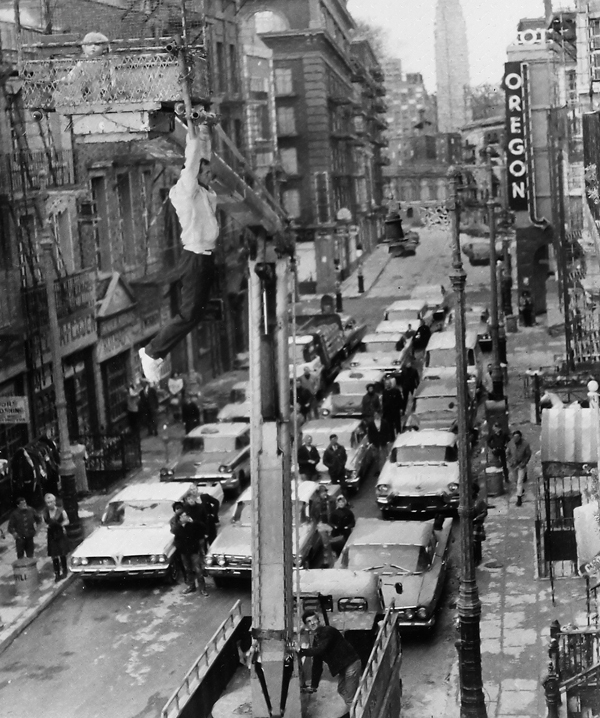 It was an ironic twist that the Daleks invaded this street for the first time when it portrayed New York but they would be back when it became London! In April and May 1965, Sci-fi horror, A Night Caller briefly used the street set and by June 1965 the forced perspective aspect had been dismantled and a new Victorian style set was built in its place for its appearance in the movie A Study in Terror and later The Psychopath. 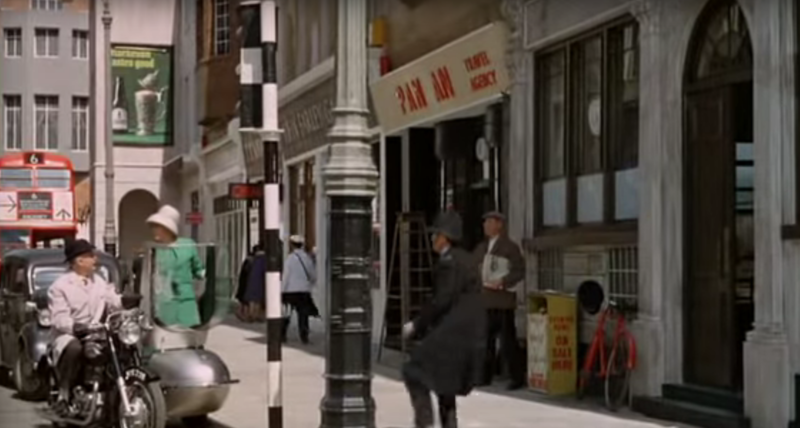 The street was also used by ITC in Danger Man and appeared in the 1965 episodes A Very Dangerous Game (with Chinese dressing), The Black Book and Are You Going To Be More Permanent? and in 1966, Paper Chase. In November 1965 the street would be used in the British comedy The Great St. Trinian’s Train Robbery which also starred Carole Ann Ford. It was at this point that two of the shop frontages had been changed. A hairdressers was required for the St. Trinian’s film and so the ‘Scotts’ frontage was completely changed to a more modern look and ultimately would become the Jewellers that features in DIE2150AD. By early 1966 the set was starting to look very run down, having stood for nearly two years in all weathers and having been re-dressed several times. However this was the perfect look for its use in DIE2150AD where it was required to portray a deserted and decaying London. Much of the metalwork had been removed from the buildings by this point and a small wall and railings replaced the Victorian buildings at the end. Beyond the railings, careful viewing reveals the mounds of earth near the mine entrance can be seen. Apart from covering up a few of the old shop signs, the set needed little work to get it ready for one of the most complicated sections of the film. 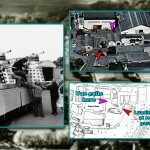 Despite its relatively short screen time the blockage scene required many of the Dalek props and a camera mounted on a moving vehicle. As the van smashes through the phalanx of Daleks, the sorry state of the street is revealed. There are a number of windows missing, and the scaffolding holding up the frontages can be seen. When the van drives towards the camera, a plentiful amount of smoke conveniently hides the view of the studios at the far end of the road. 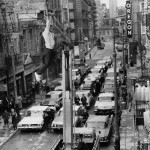 The street was used twice more in the film. It featured briefly as the entrance to the London Underground early on, with the station frontage hastily erected and partially covering the shop next to it. The movie was ‘book ended’ by a robbery scene which was filmed after the blockade sequence. The shop frontages were re-dressed so the street looked contemporary, and lights were added in some windows to bring it to life. The hairdressers used in the St. Trinian’s movie was now changed to the jewellers and blown up during the robbery. 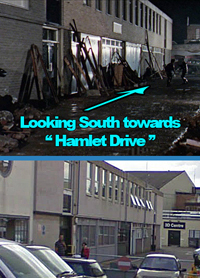 Even after the Daleks’ invasion, the street wasn’t dismantled. 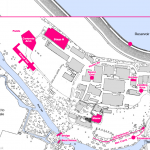 During September 1966 Casino Royale was filming at Shepperton and the set was used very briefly. A bizarre Keystone Cops sequence, originally intended as a part of a dream, and lasting literally seconds, was filmed on the street. It also featured Charlie Chaplin’s daughter. The longstanding set was situated near to the river and ran parallel to the woods alongside. 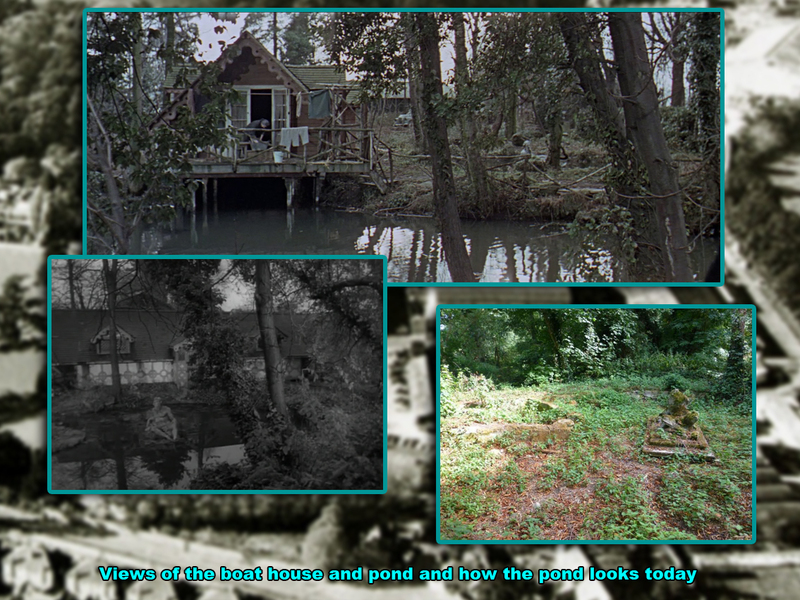 Although the river and woods still exist today, when the back lot was sold in the early 1970s the site the street stood on was lost to housing. The route the van takes. 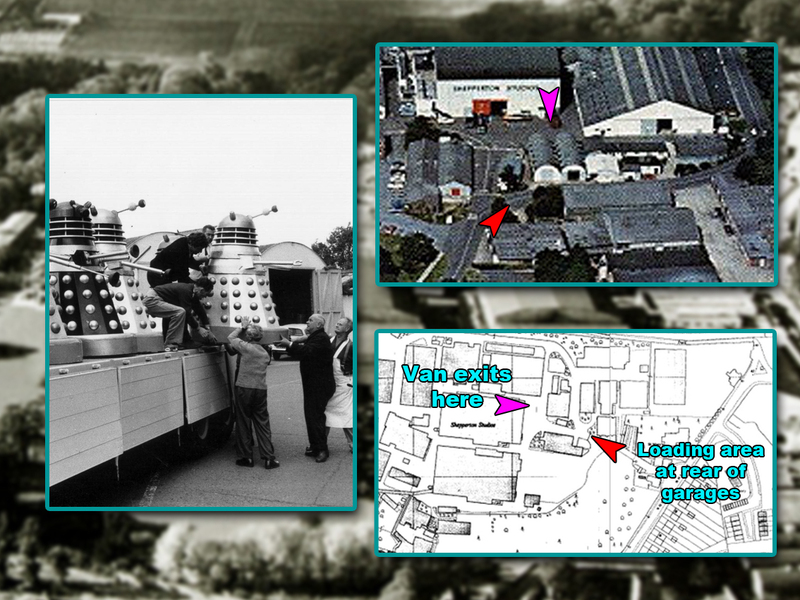 After the van leaves the street it is pursued by the Dalek Saucer through several locations. As the script indicated that the city had been left behind, a more rural road was needed. Away from the sound stages, some less well-kept routes existed near Littleton Manor house. In the final cut, the van is first seen passing what appears to be a mediterranean building with white-washed walls and terra cotta tiles. This style of farmhouse looks somewhat out of place and its unusual appearance is explained by the fact that it is another fictional fabrication not intended to portray future England. Littleton Church is visible through the trees. 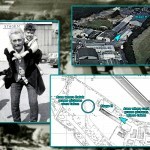 The building had possibly been constructed for the film Joey Boy in 1965 and also appeared later in ITC’s Danger Man in 1966, as it was used extensively as a French farmhouse in the episode Dangerous Secret. It was again used for the Danger Man episode The Man with the Foot, when it featured as a Spanish getaway. 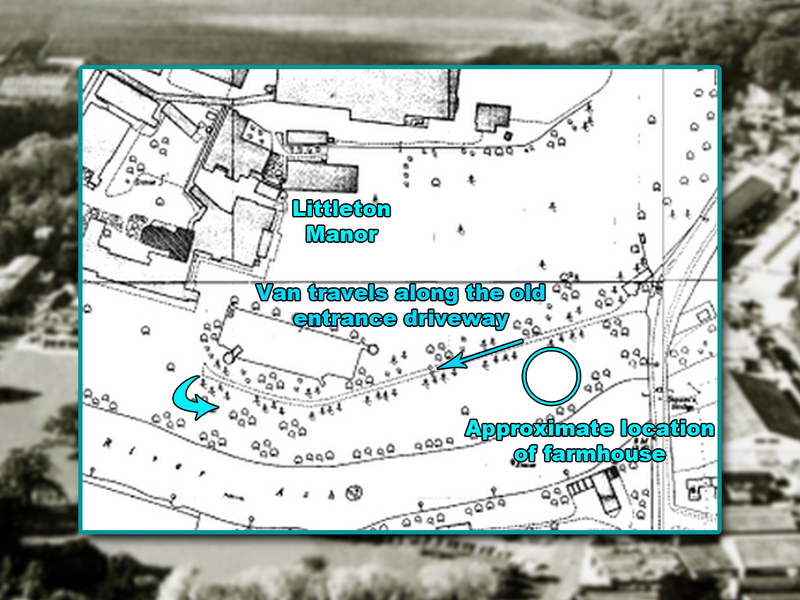 The farmhouse was situated between the original entrance path to the Manor and the river in the south east of the site (see close-up map left and click here for full map for context). When the van first approaches the farmyard, Littleton Church can be seen in the background through the trees and white studio buildings can be glimpsed between the farmhouse buildings as it races past. 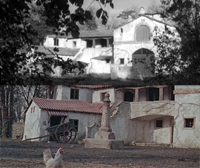 The farmhouse was demolished in the early 1970s having run its natural life, however the site is still part of the studio grounds. 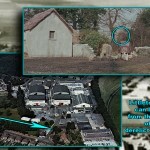 The area nearby has had seen some housing development but trees now cover the spot where the farmhouse stood. Having left “the mediterranean”, the next shot of the van shows it hurtling down what looks like a country lane. This route was the original entrance way for the manor house. Over the years that Littleton was used as a studio this path to the house became less important. A new, larger, tarmaced entrance was developed, and so what once was a beautiful, tree-lined route became overgrown and muddy. The van on the old entrance drive. As it approaches, the van passes behind the mediterranean zone and careful viewing reveals the rear of the farmhouse on the right hand side, tucked into the trees. The van comes closer and, as it passes the camera, the shot swings downwards to focus on the wheels. If the camera had not made this move then the impressive Manor House would have been revealed in the background. 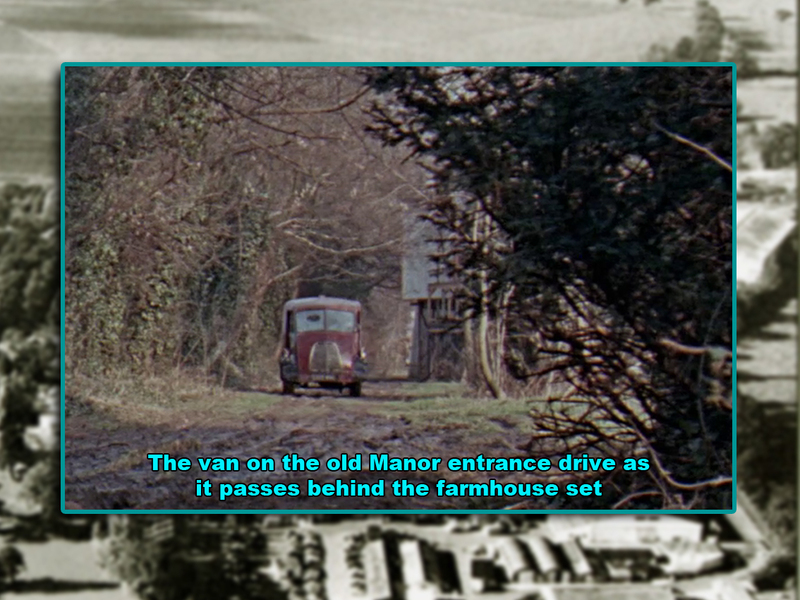 The van then leaves the path and turns into the grounds to the south of the manor. 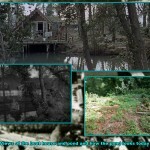 Wyler and Susan dump the vehicle between the river and the Manor, and run back towards the farmhouse set. As they exit the van, a building can be seen to the right of the frame. This studio building is now named the ‘David Lean Building’. Wyler and Susan then make their escape back towards the lane and the Manor can be glimpsed just briefly behind the trees. At this point that van was exchanged for a different SFX vehicle and blown up. The sight of a beautifully manicured lawn somewhat destroys the illusion that they are out in the neglected countryside. The grassy area where the van is destroyed is still part of the grounds to this day. The old entrance still exists and the route the van took can be walked as a footpath. 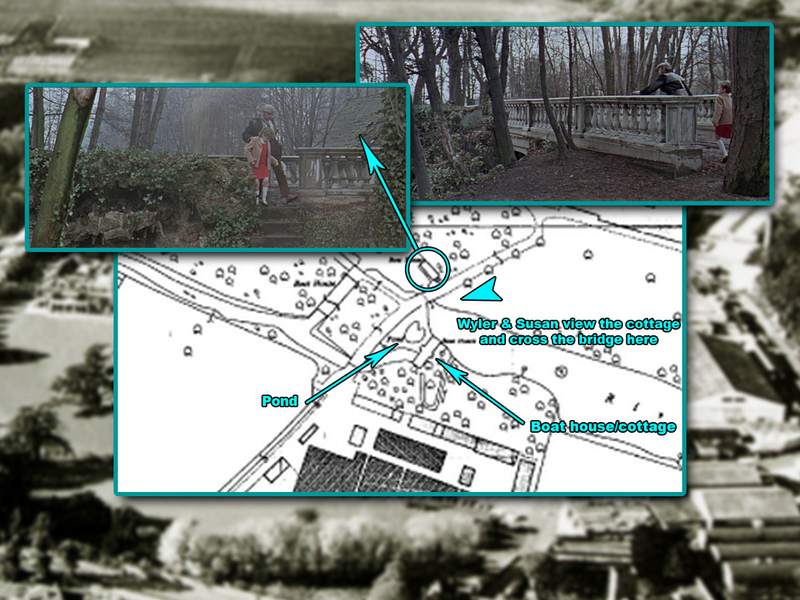 Near the entrance, where Squire’s Bridge road crosses the River Ash, is a bridge whose balustrade and overall style is found elsewhere in the Littleton Estate and on screen. 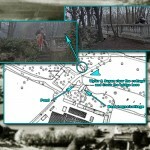 A very similar bridge can be seen in the next sequence featuring Wyler and Susan. After leaving the van, Wyler and Susan continue to make their way to the mine on foot. 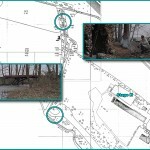 The shot of Susan jumping out on Wyler was filmed in the woods by the river to the west of the van’s destruction. On their journey, Wyler and Susan come across a small cottage inhabited by two women. This was actually one of three boat houses built by the river. 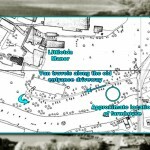 It was situated to the south of the site and next to the bridge that made up part of the original southern entrance for the Manor. 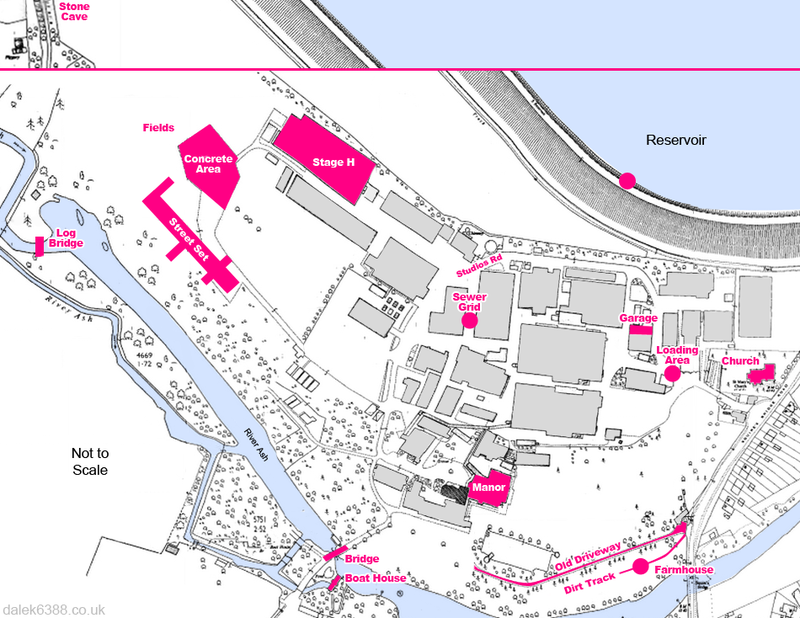 A map of the studios from the 1930s describes the area as the “Japanese Gardens”. Click here to see the large map. then in Danger Man and as it is today. The opening shot shows the boat house from across the Ash. A small pond with a statue can be seen to the right hand side of the cottage. Wyler and Susan then make their way over the bridge and down the steps on the far side. As they descend the steps, behind them can be seen the roof of one of the other boat houses. The bridge was seen the previous year in the film Die Monster, Die! starring Boris Karloff. The boat house was used at least twice in 1965 episodes of Danger Man. Once as an undertakers’ workshop in Say it with Flowers and also in the episode The Black Book. Dr. Who and David also had to make their escape through London and as they headed to the mine. Initially, after being surrounded by Daleks, they hide in the sewers of an abandoned street. 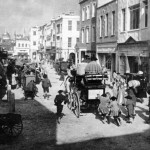 This street was one of the areas Shepperton selected to appear as London. The section of road used was between Studios Road and Hamlet Drive. A section of the ‘dilapidated warehouse’ studio scenery from the Tardis landing scene was set up in the road with miscellaneous items of junk and rubble scattered around. Click here to see the large map indicating the sewer grid. 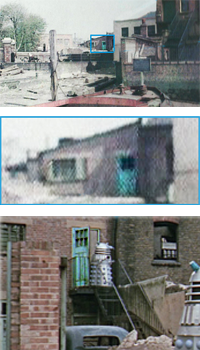 Initially, four Daleks approach from the Hamlet Drive end then the camera reverses to show the same four props approaching from Studios Road. This area has not been redeveloped and the buildings look remarkably similar today. For their exit from the sewer a different location was selected. A man-hole near Stage H was chosen and more debris was strewn around to complete the effect. After leaving London, Dr.Who and David also make their way to the mine. At one stage they are attacked by two Robomen. The bridge in this shot was situated further along the river from the boat houses, to the south of the mine. It was described as “African Jungle” on the 1930s studio map and was the location where the aforementioned film Sanders of the River was shot.The spur of river on which the bridge stood still exists today but it is unknown if the bridge or supports remain. The positions of the structure in the drainage channel and the Roboman bridge. Near the bridge stood a stone ‘gazebo’ structure. Although this wasn’t used in DIE2150AD it was used extensively by other productions including The Oblong Box in 1969 which starred Vincent Price and Christopher Lee. Danger Man also made use of it in The Black Book. Having survived the attack, David and Dr. Who take a rest at a small, man-made stone cave. 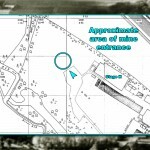 The exact nature of the structure is is unknown but it was situated in a drainage site that ran alongside the western side of the mine and towards the reservoir. The large bank of the reservoir can easily be spotted in the scenes. 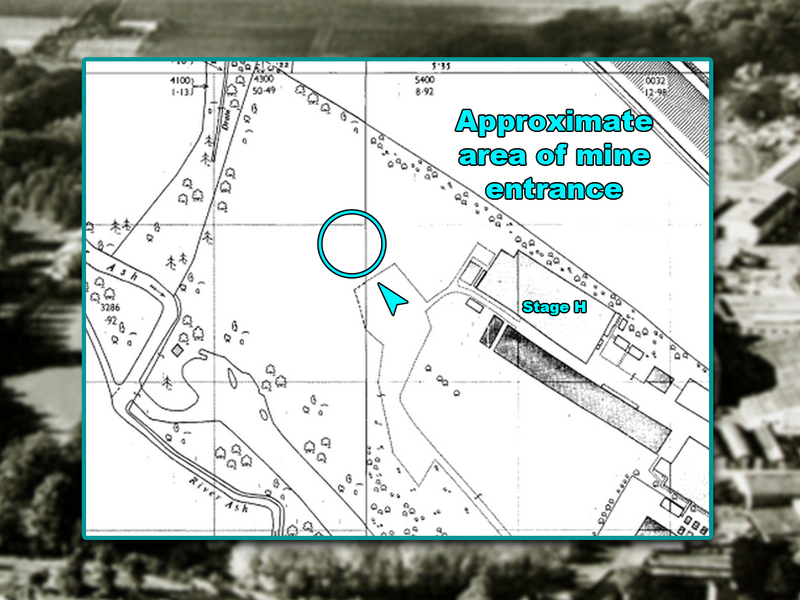 Its possible the “cave” was connected with animals as there appears to be recesses for food inside and a 1970s map suggests there is a Piggery in the field adjacent to the mine. The drainage site still exists today. For scenes set within an abandoned warehouse, there was nothing appropriate on the Shepperton site so the decision was made to travel the shortest possible distance to a suitable location. 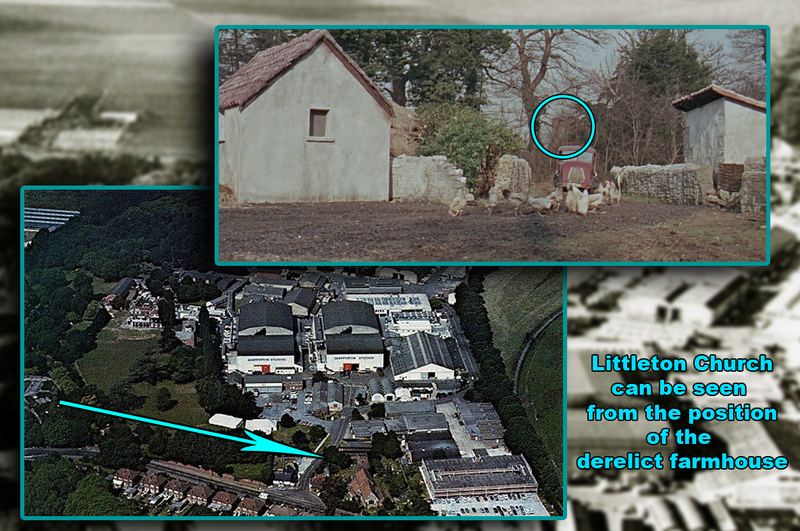 Cast and crew made the journey of just over a mile to the east side of the Queen Mary reservoir to Littleton House where the Newfeld Bendy Toys factory was situated. 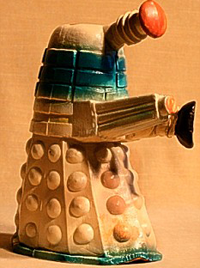 The company was set-up by Charles Neufeld in the late 1950s and it manufactured many types of rubber toys including the, now rare, Bendy Dalek toy. The Neufeld family had fled to the UK from Austria in 1939 after the Nazis confiscated their small store. The family was broken up, with Charles’s mother, father and brother going to Scotland and his sister to Wales. Charles himself stayed in Berkshire where he was educated. Towards the end of the war he had a short spell in the American Army intelligence corps. On his return to the UK he joined Dunlop where his skills with rubber were learnt. The scenes filmed at the factory included boxes clearly stamped with the company logo and one shot even showed an open box of rubber toys. The area the factory stood has now been redeveloped. The most iconic moment in the story posed the biggest problem. 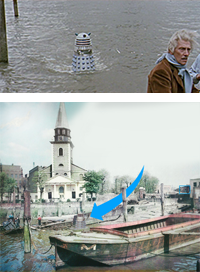 A Dalek was required to rise out of the Thames. Whilst some shots of Louise at the water’s edge were easily captured at the Queen Mary reservoir, the more complex shot with the Dalek could only be achieved at the real location, just as had happened with the TV story. A trip to the real London would be the final work carried out for the film, and the the team arranged a day’s shoot in Battersea. The jetty near St. Mary’s church on Battersea Church Road was chosen as a suitable location as it had good access to the Thames and offered an easy way of getting a Dalek prop in and out of the river. The church, although not seen in the film, has a number of interesting historical facts connected with it. Painter and poet William Blake was married there, J M W Turner was known to have painted nearby and Benedict Arnold, a general in the American Revolutionary War who defected to the British, is buried in the crypt. Close by to the jetty were some fire-damaged warehouses which made an ideal depiction of the destroyed city, and so an extra shot was taken to help boost the screen time of the Daleks. A matte painting of the Lots Road Power Station on the far side of the Thames was also used to help complete the illusion of a chaotic future. In the painting, as well as the general devastation, the station had three of its large chimneys destroyed and damage was added to the gas tower in the background. The station, when built, was the largest in the world and started generating electricity in 1905. It provided power for the tube lines for many years and finally ceased generating in 2002. The jetty and church still remain today, along with the power station on the far side, although two of its chimneys have been removed – this time not by Dalek Invasion! Like Battersea Station, many attempts have been made to develop the site over the years, but without success to date. The derelict warehouses, across from the jetty, have long since been demolished and now the Somerset Nursery School stands on the site. The production of the second Dalek film highlights perfectly how budget-conscious producers were quick to pounce on readily-available, and therefore cheap, existing sets – a process rarely seen in today’s multi-million blockbuster industry where almost everything is created especially for a new production. The Dalek films may exist inside their own little continuity bubble in Doctor Who’s canon but their existence touches on the history of many other famous films and TV shows. Despite the financial problems that had dogged the studios throughout the 1960s and 1970s, Shepperton had also been behind some of the most famous movies of the times including Doctor Strangelove, A Clockwork Orange and Alien. Whilst Peter Cushing’s science fiction contributions don’t rank alongside these cinematic classics, the two Dr Who films made at Shepperton do represent an important meeting of two global institutions. Both the interior and exteriors at Shepperton continued to find fame in various guises. The St. Mary Magdalene Church appears in the Dad’s Army film and Littleton Manor house has been used in movies such as Bridget Jones. 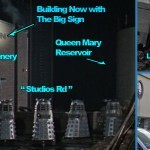 The gigantic Stage H which was briefly home to the Daleks was used in such recent blockbusters as Batman Begins in 2004. 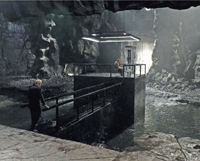 The ability to flood the entire stage was employed for filming sequences inside the Batcave. It was also used in, perhaps, the most famous Sci-Fi adventure of all… Star Wars, where it housed the Rebel Base and End Ceremony sets. 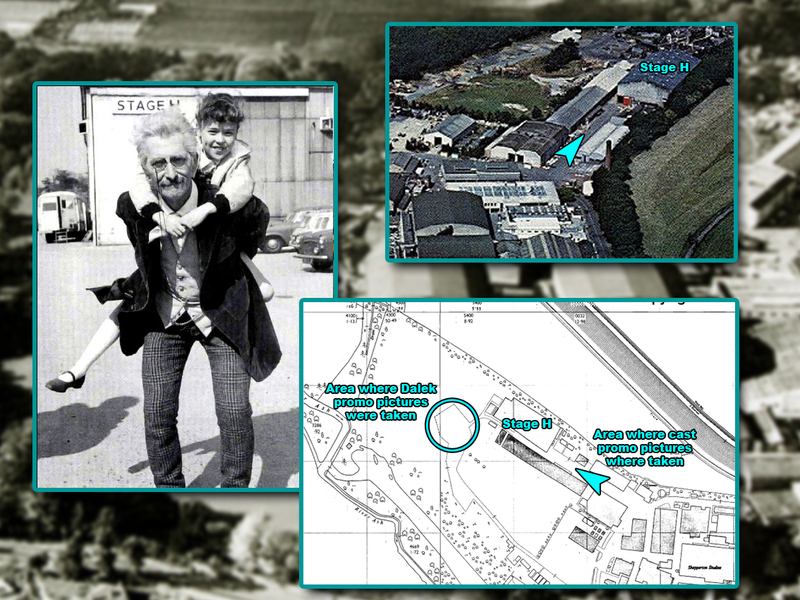 The site is now owned by Pinewood group whom acquired the studios in 2001 and these iconic locations continue to be associated with British film-making. With thanks to Anthony Mckay at Avengerland, M. Courtman at ‘The Danger Man Site’, Michael Richardson and Windyridge at the Brit Movie forum, Martin Kempton at Shepperton Studio History page, Christopher Hill and Richard Hart.